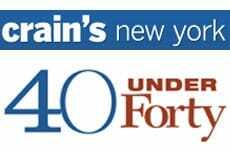 NYSCF Lab Director Scott Noggle Named to Crain’s New York 40 Under 40! NYSCF is proud to congratulate Dr. Scott Noggle, Director of the NYSCF Laboratory, on his selection as a Crain’s New York Business 40 Under 40 rising star! Dr. Noggle is leading the new NYSCF-Golub Stem Cell Research Initiative for Parkinson’s Disease.